More New Blackberry Patent Applications | BlackBerry Blast! 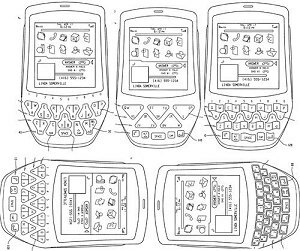 More RIM patent application pictures have surfaced. Unwired View has the goods on the latest patent application from RIM and there are a couple of interesting features in this one. First of all as the picture suggests RIM is thinking about different keyboard layouts. There seems to be a focus on directional keys for some reason. Could they be trying to save space or does this represent some kind of fancy keystroke pattern? Another interesting feature that RIM is apparently looking at is a Pickpocket notification device with special holster. When pickpocket mode is active and your Blackberry is removed from the holster, you are required to authenticate yourself. If the holster does not receive authentication signal within a set period of time it renders your BlackBerry unusable and starts sounding an alarm. Check out the source link for more details from Unwired View.